In Beer-Sheva, it was a warm, dry night. The atmosphere was that of a street festival, and babies and small children abounded, despite the late hour. But something interesting was happening. Taking the focus off Tel Aviv changed the nature of the protests. In Haifa and Beer-Sheva, we saw a far greater inclusiveness in the protests than we had seen before, with gay pride flags flying high, signs for handicapped rights, and most of all, significant mike time given to Arab Israeli issues. 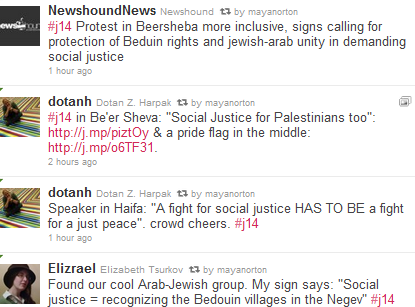 In Beer-Sheva, Hanan Alsana (חנאן אלסנע), a Bedouin woman, was one of the headline speakers and a highlight of the night to many. I know many people are uncomfortable with Twitter, and that’s fine, so I’m bringing it to you. Here’s a live account of what people were saying as the protests happened. Some women get turned on by shoes. They see a gorgeous pair of stilettos gleaming and sparkling in the store window and know they have to have them. That’s how I feel when I see a great opportunity for giving. I want to possess it, invest in it, feel ownership over it. For a starting price of only $25, you (the donor-lender), can give a hand in helping Victoria expand her business and improve her quality of life. That $25 that you might have spent on coffee and subway tokens goes a long way in helping Victoria and in giving you a feel-good donor experience. For a total loan of $550 (to be repaid by December 2011) you get a significant bang for your buck. When I created The New Jew in 2007, my intent was not to start a blog on Jewish philanthropy. No, my goal was to start a revolution in Jewish micro-giving (that is, giving in small amounts). I grew up in an affluent community and my youth was immensely enriched by the experiences I had traveling and volunteering both in the US and abroad. I come to philanthropy with the conviction that everyone has the capacity to give something, they just need to be inspired enough to do it. At that time, there was no JGooders,* no IsraelGives, no DonorsChoose, or any other programs to support and promote small giving. What was lacking, I believed, was an organization to help inspire giving and channel donations on a personal level, igniting that critical spark at the moment of giving. * JGooders is now defunct. What I wanted to do was to enable those with “extra” disposable income, regardless of the amount, to donate on a person-to-person or person-to-project basis with direct results. Ultimately what I hoped for was to work with every nonprofit in Israel to create a wish list that could be entered into a larger gift catalog for potential donors to access via the web. Inspired by the environment? 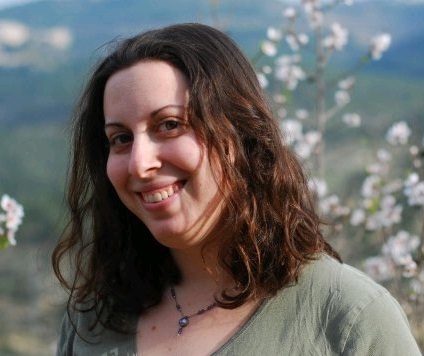 Why not give to the Kibbutz Lotan, specializing in eco-conscious living, or Tevel b’Tzedek (Earth in Justice), which promotes sustainable development through the lens of Jewish values? The options would be beautifully endless. Tomorrow you will see a new entry on The New Jew, but tonight I have a special present for you. 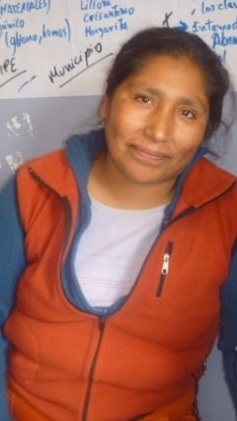 This is my first week as a lender-donor on Kiva and I’ve found it to be such an interesting, fulfilling experience. I want you to join me. So who are my top prospects right now? I’m looking at Medhi, Evelyn. 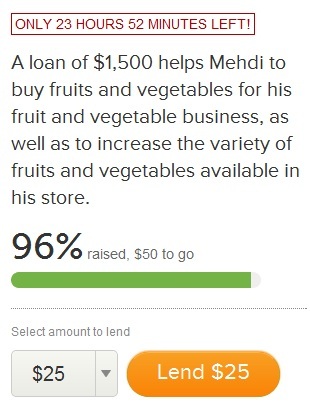 Mehdi has one day left on his loan- at time of writing, $250 is needed- to help him expand his fruit and vegetable business. He is interested in expanding his offerings, and hopes the loan will help grow his business, and therefore help him better support his family, whom he cares deeply about. Here’s how Kiva gets you with the urgency (see graphic). Funding Mehdi was my first longer term loan. Up until now, I have strongly preferred loans that are coming due in the short term (i.e. this fall). Something you should know is that all lenders are refunded at the same time, incrementally. You don’t get one final amount back at the end, but you’re refunded small amounts according to the borrower’s payment schedule, which is outlined in detail at the bottom of the screen. What a week. And here’s the truth of it: nothing makes you want to connect with other people more than a crisis- and for me that means writing, blogging, and Facebook. I was contacted several times this week by reporters of the mainstream news, but I’d rather tell my own story in my own words. 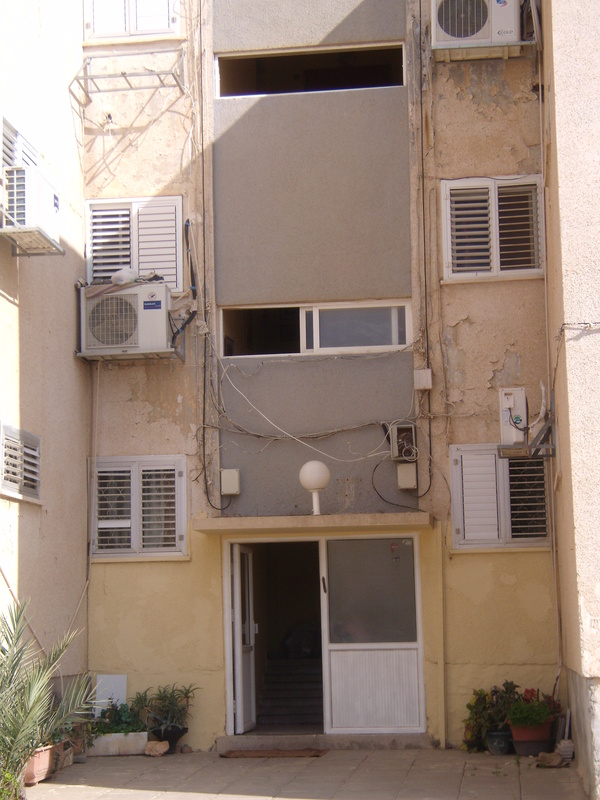 On Wednesday morning, March 23rd at 5:30 am, the alarm sirens blared in Beer-Sheva. For those of you who have never been in this situation, the siren sounds for 60 seconds and you have that amount of time to get to your bomb shelter, safe room, or the nearest approximation [see footnote]. I was sleeping with my two and a half year old son (my husband was working) when the siren sounded. I grabbed the baby, my shoes, and the keys and walked rapidly toward a building across the street so that we could make it to the nearest staircase [left]. Let me tell you this. 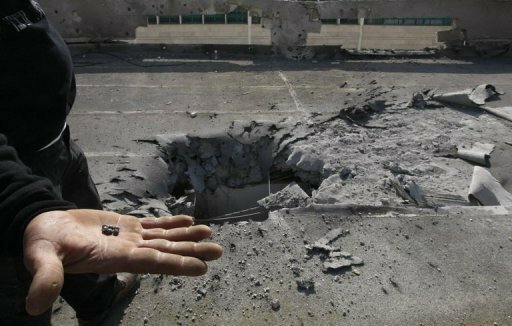 Unless you live in Sderot, perhaps, when you hear that siren, your heart stops, but you don’t think it is going to affect you directly- meaning in front of your eyes. You believe that there may be a missile coming toward you and that you need to take action to protect yourself, but you don’t believe that it’s coming straight at you. My opinion on that front has now changed. Let’s get right down to it. Jumo is a new social networking platform that intends to improve the way nonprofits, organizations, and individuals communicate online. But what value does it have given how many others options are already available? Does it offer us something beyond the benefits of Facebook? And most importantly, is it good for the Jews? I asked Tova Serkin, a leading expert in Jewish peoplehood and nonprofit fundraising to find out. I want Jumo to succeed – I really do – but I wish I were more optimistic. The newest social network to break into the field, Jumo was launched last week as a platform for those interested in social change and charitable organizations. Created by one Facebook’s founders, Chris Hughes, the site has already garnered tremendous press – and the pressure for success is on. Because of Hughes’ extensive experience both with Facebook and Barak Obama’s online fundraising campaign expectations, also in the from of venture capital, are high. But through my time at JGooders, I have seen first hand how difficult it is to engage even the most committed activists in e-philanthropy of any sort. Here is my take after a few days of exploring the site. If you don’t look carefully, at first you might think Jumo was just another Facebook redesign – the similarities are multiple and conscious. Creators figure that if we are familiar and comfortable with one platform, some of that might transfer to them. And in fact, you must have a Facebook account to use the system effectively. Essentially, social causes open pages, and users choose to follow the projects and charities that interest them. The focus is on relationship building as opposed to soliciting donations, but recognized charities in the US are able to raise funds as well. Overall, barring some initial kinks in the Beta version, the site is clear, easy to understand and heralds a new way of interaction with organizations – at least in theory. But Jumo faces some tremendous uphill battles before it can truly take off – while on paper it the idea of building community around specific social causes is compelling, in my experience, it is virtually impossible for most organizations. There’s no question in my mind that women do it best when it comes to relationships. We’re more giving with each other, more intimate, more talkative, and more forgiving. That’s why hearing and amplifying women’s voices is so important to the process of Middle East peace. After all, the essence of meaningful coexistence is strong, healthy relationships. If you care about women and the Middle East, it is essential that you listen to the voices of the women in these videos. This morning I came across TEDx HolyLand– the only TEDx conference in the world devoted to women’s voices and narratives. (Note that the full name of the conference is TEDx HolyLand: It’s Time). Kattan explains that the HolyLand conference was sponsored by a Palestinian (lesbian) woman who wishes to remain anonymous. As someone who cares about these issues, I can’t think of a better use of funding to forward peace. Here I also want to note how many of these women tread the borderlines of mixed identities, as you will hear below. They are Arab, and Israeli; they are Muslim, and sometimes lesbians; they are Middle Eastern, but occasionally educated in Europe or the United States. It is my belief that the power of their voices comes from their experience with transboundary identities and the spiritual beauty that comes from exploring all aspects of the self. Israel needs your help. 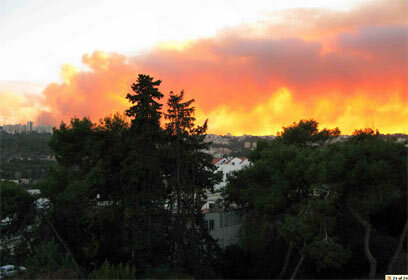 The worst fire in the nation’s history erupted yesterday from the forests of the Carmel in Haifa. International aid from Britain, Bulgaria, Cyprus, and Greece was offered almost immediately to help quench the flames as Israel’s resources were quickly depleted. More than 15,000 residents evacuated, flames near Haifa. Mass evacuation continues into night as fire ranges in northern Israel, thousands of Haifa residents ordered to leave homes. At least 40 dead; casualty information center reopens for first time since Second Lebanon War. 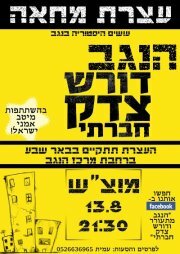 The Jewish National Fund has established a Forest Fire Emergency Campaign. The JNF has also organized an international conference call on Friday, December 3rd for 12:00 EST with CEO Russell Robinson and several of their chief executive officers, as well as Shimon Romach, Chief of the Israel Firefighters, and Tim Tidewell, US Chief of the Forest Service. Click here to register and log-in information will be sent to you. Note also JNF’s projects to Help Alleviate Israel’s Water Crisis, Forest Management and Fire Prevention, and Friends of Israel’s Fire Fighters. You can learn more about them here.